In celebration of ISUS 2018, enjoy one free week of access to these top-read articles. Utilitas is one of the leading international journals in ethics, offering high quality research in all aspects of the development of utilitarian thought and in all areas in which utilitarianism has made a contribution. 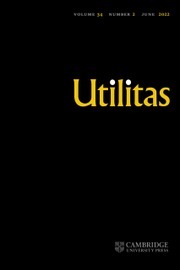 As a pioneering, interdisciplinary journal, Utilitas will be of interest not only to moral philosophers but also to economists, political theorists, intellectual historians and legal theorists.